Riamu Yumemi is a character in the game The Idolmaster: Cinderella Girls. Riamu Yumemi first appeared in The Idolmaster: Cinderella Girls on February 7, 2019, as a boss in the Tottori Area. ・Her first-person pronouns are boku (typically used by males) and Riamu-chan. ・She may come across as a highly spirited character, but her mentality is actually quite fragile. She would refer to herself as having the mentality of a small fry and her favorite word is yamu ("so sick" or "depressing"). ・Her hobbies are writing suggestive poems in the middle of the night and participating in concerts and events. As you can see, she has all the features that the online community will find likable. Social media are raving about her character design and personality! Her two-toned bob hairstyle (which is in pink and light blue), pill-shaped accessories, and the T-shirt she's wearing with a skull printed on it make her character design resembles those of the yume kawaii fashion genre. Coupled with her penchant for using Internet slang, such as the way she says "Like me!" (boku wo sukore), she managed to instantly garner the attention of the online community. Among her fellow Cinderella Girls idols, Yumemi can be considered one of several idols with amazing bodies, and yet, she doesn't seem to be that confident about her own figures. She is aiming to be a top-class idol to seek revenge toward society and earn their recognition. These things about Yumemi have ignited a sense of affinity and a desire to protect her in the hearts of many producers (the game's players), and perhaps, this is why many people are becoming her fans. She has also gained a surge of fans on pixiv. A day after she was registered in the game, she managed to rank on the list of top searches among men. 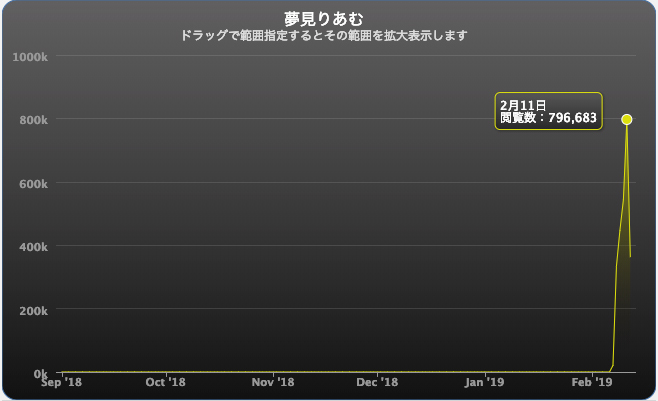 ▲ The list of top searches among men on pixiv Creative Ideas as of February 11, 2019 (top) and the number of views (bottom). These figures are triple the numbers recorded by Akira Sunazuka, a fellow Idolmaster character who was a hot topic up until recently. Check out these illustrations of Riamu Yumemi!